Image: MLS AR of the Year Corey Parker (far left) is on duty at RFK Stadium in Week 4. Just three games take place in Week 4 of the 2016 MLS season, with the match-ups all coming on throughout Saturday, March 26. 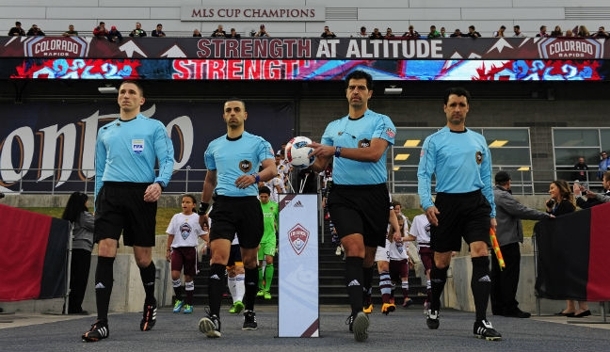 Ricardo Salazar is the center referee for New York City versus New England Revolution, which gets under way at 3pm ET. It’s the first assignment of the season for Salazar, who will be joined by ARs Peter Balciunas and Oscar Mitchell-Carvalho, and fourth official Jaime Herrera, who debuted in Week 3. Then we head to the capital where D.C. United welcome FC Dallas to RFK Stadium. Jose Carlos Rivero has the whistle for this one, and he will be supported by another new member of the PRO roster – Rubiel Vazquez – who takes fourth duties. Corey Parker – the 2015 MLS AR of the Year – is also part of the crew, along with fellow AR Andrew Bigelow. Last but not least is Dave Gantar, who takes charge of Vancouver Whitecaps versus Houston Dynamo. Like Salazar, it’s a first assignment of the new campaign for the 40-year-old, who represented PRO at last year’s CONCACAF Gold Cup. Michael Kampmeinert and Jeremy Hanson will run the line, while Younes Marrakchi has been assigned as the fourth official. It’s also kick-off weekend in the USL, and you can find the assignments for Week 1 here.